Organized, fun, and structured programs that take place inside the safe environment of your child's school led by our certified coaching staff in a safe, positive, and encouraging manner. Programs are 100% mobile and we provide all equipment necessary for each class. Up4Tennis approach to teaching young children is to teach it in a way that makes learning fun and relevant to the way kids see the world. In addition, all activities and concepts progressively build upon each other to make sure the concepts are easy to grasp for the age of the child and they feel good about their progress. 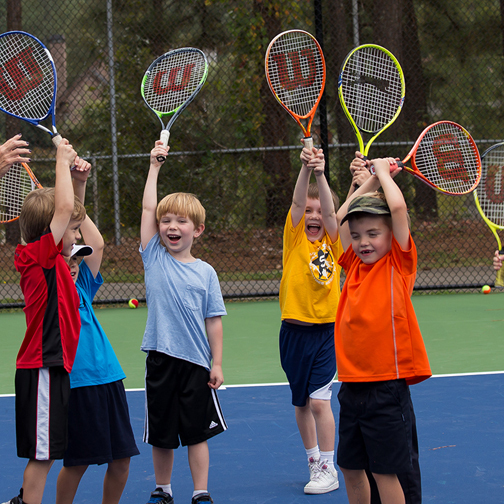 This means students build their self esteem with each lesson which leads to maximum learning and kids who want to keep playing tennis. We follow an effective class format and simplify concepts so students progress with each lesson. Up4Tennis breaks down the fundamentals of learning tennis into simple core motions that lead to a more controlled and consistent shot and strong fundamental technique that lays the foundation for a further tennis advancement.